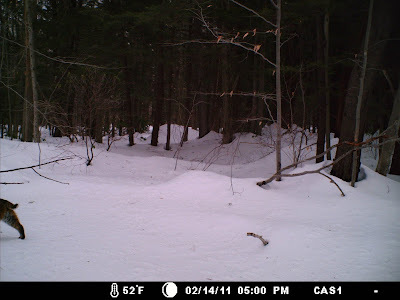 February 25, 2011 – This morning I finally had a small window to make a qu ick dash into our 700-acre preserve in Goshen to look for signs of New England Cottontails – or more accurately: to look for their droppings. The New England Cottontail is the only mammal species endemic to New England and is currently being considered for inclusion in the federal Endangered Species Act because of its low numbers and unknown population status. It competes for habitat with the introduced Eastern Cottontail, from which it is very difficult to distinguish by sight alone. The only reliable way to tell both species apart is through DNA analysis – hence my quest for bunny droppings or other analyzable samples, such as fur. New England Cottontails prefer early successional habitat in forested areas and we have been actively managing the habitat in the Croft preserve to reflect these habitat conditions. I have seen Cottontails in the preserve and the nearby Goshen WMA is currently the only area in the state known to only harbor New England Cottontails and no Eastern Cottontails, so the odds are pretty good that they inhabit the Croft Preserve. 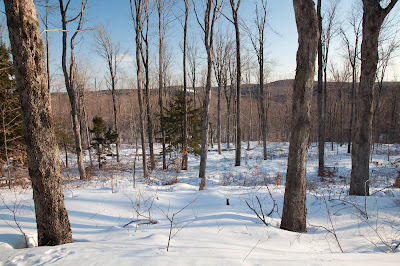 However, we want to be absolutely certain that the woodland habitats in the preserve are managed correctly to provide suitable conditions for our target species. 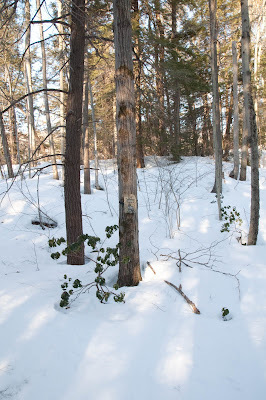 Of course, the preserve is still covered in at least a foot and a half of snow (even more in the de nse hemlock stands where the forest floor receives hardly any sun). This was actually the main reason why I headed in now, because it is much easier to find tracks (and bunny droppings) in the snow. 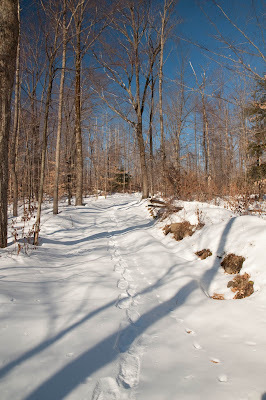 As I snowshoed into the preserve I noticed a pair of coyote tracks following the main logging road into the sanctuary. 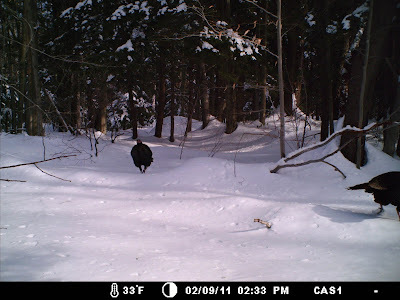 I followed their tracks for more than a mile before they veered off into the woods. As I went along, my path was crossed by relatively few other tracks; squirrel tracks darted back and forth between closely spaced trees and only a single set of deer prints was seen crossing the woods on my 2-mile hike in. Here and there sets of small rodent prints radiated out from a burrow in the snow. One of our managed early successional habitat plots is looking good with its relatively open canopy. As soon as the snow melts a dense shrub layer will form on the forest floor to provide cover for all sorts of wildlife. 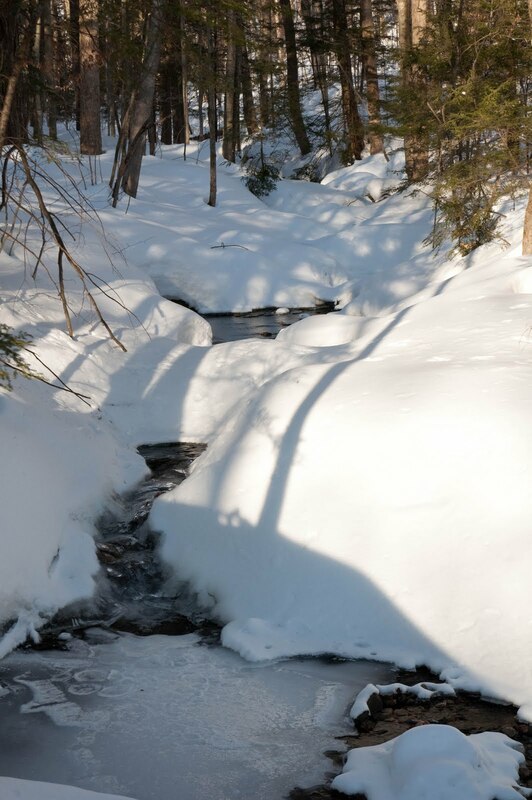 In spite of the 8 degree F temperature and thick snow pack there was still open water in some of the streams. 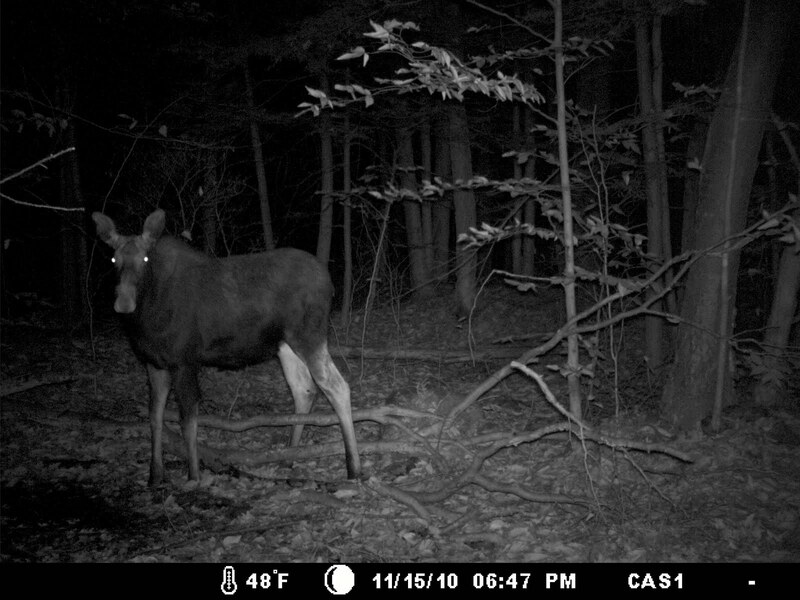 Since I was near the area where I have an infrared wildlife camera set up, I decided to swap out its memory card to see who had been utilizing the wildlife trail it is set up on for the past few months. A flock of Wild Turkeys looks for food in the snowy northwest hills. This fast-moving Bobcat almost walked out of the frame before being immortalized, but its white-tipped short tail gives away its identity without any doubt! Alas, I did not find any bunny droppings today. 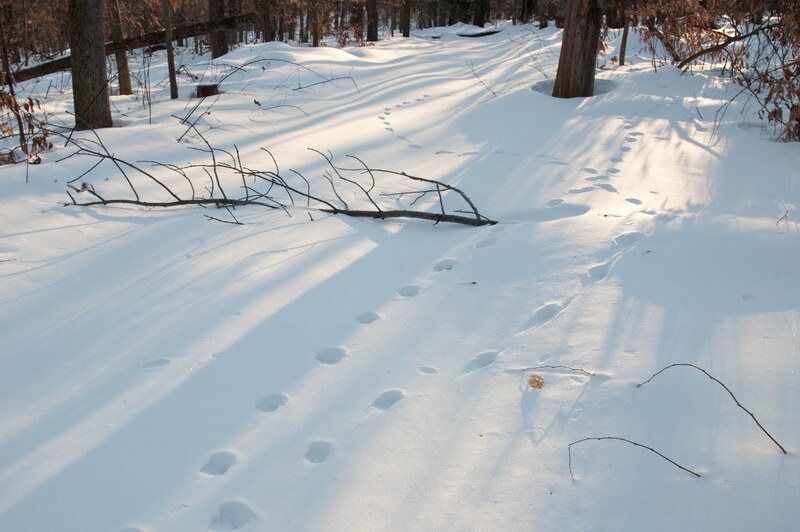 In fact, there were hardly any rabbit tracks in the area at all. 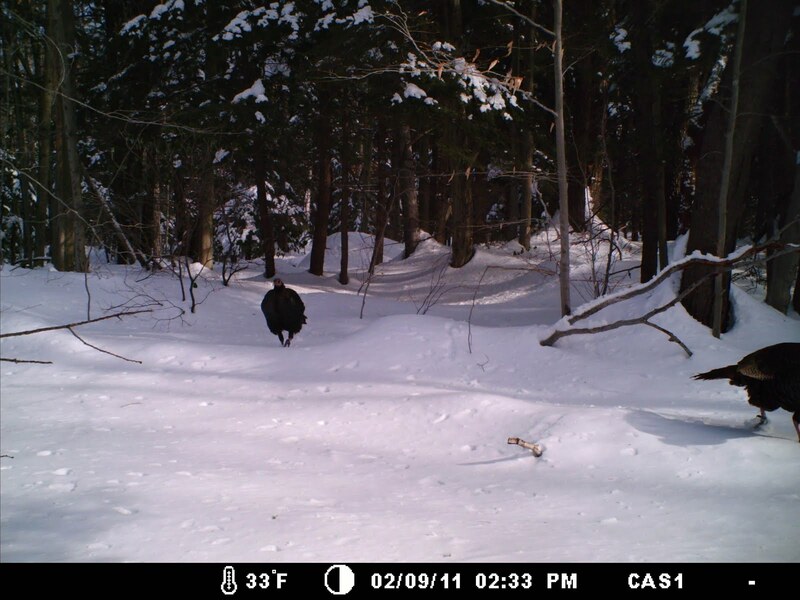 Clearly conditions are still too cold and harsh for these animals to be out much. 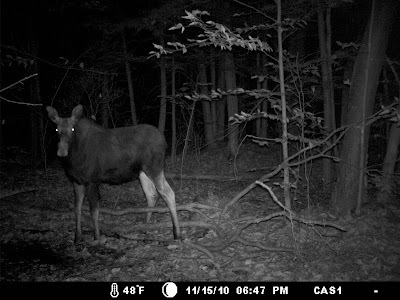 However, we now have confirmation again that all kinds of animals utilize the woodland and early successional habitats in our Croft preserve – even when we don’t always see them. We’ll just have to keep surveying!